Mark Silverman was a giver. A giver of love, advice, help and laughter. And after talking to community members, it is clear: Silverman was a gift that deeply impacted the people of West Linn. After being diagnosed with a rare form of cancer in his appendix and abdomen in November, Silverman died Dec. 15 at age 61, one day after his birthday. "He just went from driving and being OK, (to being) hospitalized, and never got out," said Jill Winters-Silverman, Mark's partner of eight years. "He was incredibly strong and prideful right to the very (end), more worried about others than he was about himself." Silverman experienced no symptoms of this aggressive form of cancer until Nov. 5 when Winters-Silverman said he started feeling a pressure in his abdominal area. He had one dose of chemotherapy Dec. 8, but his disease was too far along. "We knew going in, the chemotherapy was going to be a 50/50 chance. It was either going to be something that would help and everything would rejuvenate, or that it would hasten his passing — no blame intended. He was the one that said, 'I got to give it a try,'" Winters-Silverman said. "It was so fast." Silverman had two daughters and two step-children. And he was on his way to becoming a grandfather. "He was definitely looking forward to meeting his first grandbaby, who will be a girl," Winters-Silverman said. "That was something we were all hoping for because we knew he would be a fantastic papa." Before Silverman graduated from University of Oregon with a bachelor's degree in education and received his master's degree in counseling from Portland State University, he worked on a kibbutz — a collective community in Israel that was traditionally based on agriculture. There, he taught children how to speak English and play tennis. This is when he discovered he wanted to become a teacher. 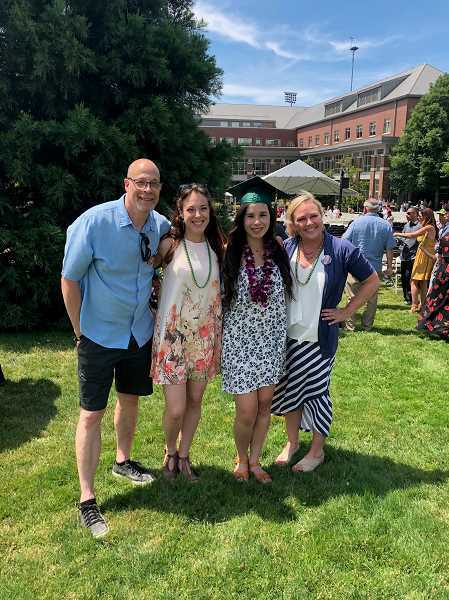 Silverman was in education for 35 years and worked in the West Linn-Wilsonville School District for 27 years as a classroom teacher and then a counselor at Willamette Primary. He retired in June 2018 for about two days, said Winters-Silverman. "He took a part-time job at Alliance Charter Academy in Oregon City," Winters-Silverman said. "They fell in love with him there. (He was) looking forward to the opportunity of working with high schoolers for the first time." Silverman also took another part-time job supervising soon-to-be counselors at Lewis and Clark College this past August, and he also owned a private counseling business. "Mark's entire career was based on being kinder than necessary," Winters-Silverman said. "He was the best at when someone was having their own grief or crisis. He was such an optimal listener and when you were in his presence he really made you feel like you were being heard and understood without being condescending or without being arrogant." Staff and students at Willamette Primary couldn't agree more. "I think other leaders that have been at this school would say that he helped shape who we are as leaders at this school," said Nicole Minor, instructional coordinator at Willamette. "He went above and beyond his job description as a counselor. It's kind of hard to put it into words." Wellness teacher Kelly Oliver looked forward to hearing Silverman's lessons on bullying, empathy and compassion when he visited classrooms. "Mark's lessons were ones I always looked forward to because he was such a master teacher," Oliver said. "I not only learned life lessons right along with the children, but his modeling made me a better person and teacher. He just did that — made us all better by being who he was." 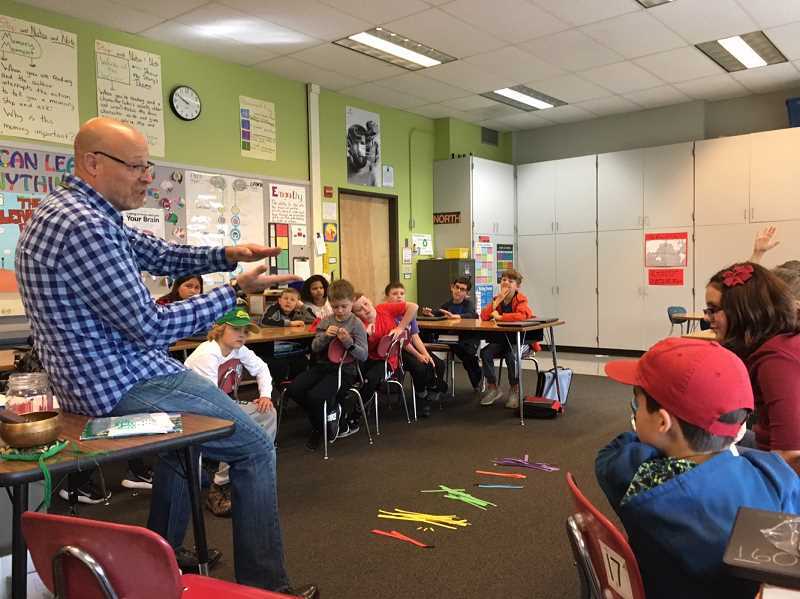 After all, his phrase "Be kinder than necessary" has become Willamette Primary's mantra. But that wasn't Silverman's only phrase that students and staff remembered. 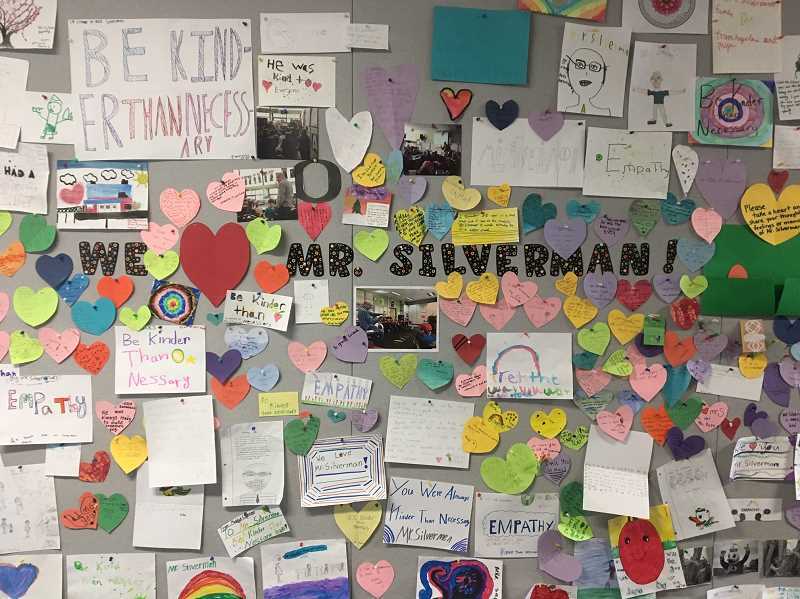 Fifth-graders Alyssa Johnson and Jocelyn Caveney laugh when they think about all the phrases Silverman — who is said by staff and students to have been one of the funniest men ever — would say. "When you made a mistake, you had a 'rubber chicken moment,'" said Caveney, who remembered the rubber chicken Silverman always carried around to classrooms. "Mark used the 'rock brain' analogy so perfectly to teach children about how getting 'stuck' in our thinking can make small problems turn into big ones," Oliver added. "He stressed the importance of having a 'squishy' brain; one that allows a person to adapt and solve problems." Silverman would also go out of his way to talk to students about any number of problems they had. "He was really funny; he was really sweet and he always remembered your name," said fifth-grader Kendall Atwood. "When people used to bully me he would always help me with it and he talked to me about it and then he'd let us come have lunch and it always made me feel better. ... He cared about every problem you had, even if they were little." Caveney said Silverman was always smiling. During Silverman's time at Willamette he also created and led the SOAR program for 18 years. SOAR was a summer offering for students at Willamette who couldn't afford camps. Silverman also choreographed the staff dance in the school's rhythms program — where each classroom of students would perform a dance for parents at a big assembly. "That's actually one of our most favorite things of the year, our staff dance, because it brings us all together in a fun setting instead of stress and stuff and he always made it so fun," said school secretary Inga McDevitt. "There's a million stories about Mark out there," Willamette Principal Patrick Minor said. "Mark was just a special, special person — a remarkable person. ... He was the type of person who if anyone goes to him with a problem or question you left not only knowing what you needed to do but felt more confident in your ability to do so." Willamette Primary held a celebration of life for Silverman Friday, Dec. 21, and friends, family, Willamette alumni and current students and staff paid their respects and shared their memories. "In this time of incredible sadness, Mark would be the one leading the charge to help us through this," Oliver said. "He was masterful at making someone feel that they were the most important person at that moment in time. ... You don't get that feeling from a person unless it is 100 percent genuine and heartfelt. That's why we all love him so much." For those who want to take an action in Silverman's memory, his family encourages people to donate to The Portland Audubon Society, https://audubonportland.org/support/give/general-donation and The Dougy Center, https://dougy.ejoinme.org/MyPages/DonatetoTheDougyCenter/tabid/126598/Default.aspx, two organizations that were important to Silverman.